Triple N Ranch WMA (Note: WMA is Wildlife Management Area, seasonal hunting is always allowed in this type of area) is located in Osceola County off RT192. 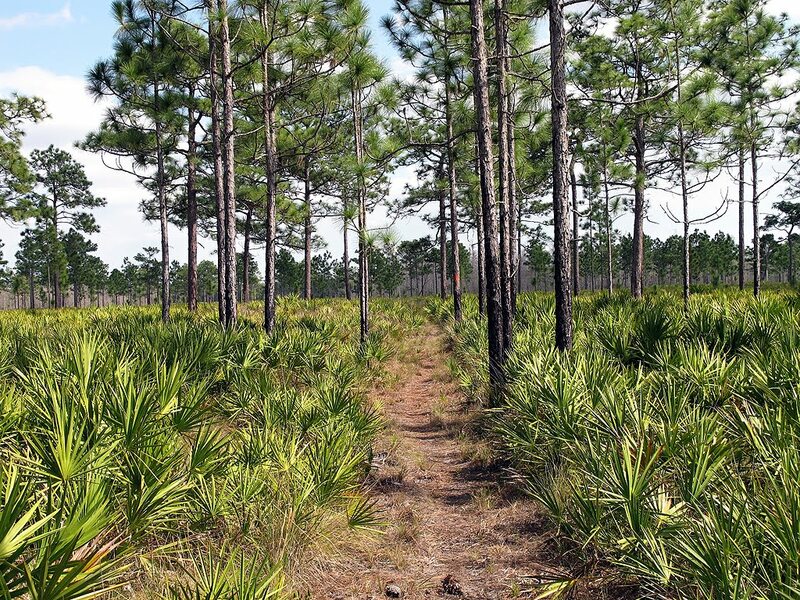 It is comprised of 16,295 acres of many ecosystems, mainly pine flatwoods. As the name implies, the property was originally a ranch, so it is crisscrossed with dirt roads. If you look around you will find remnants of the old ranch, but they are disappearing as each day passes. Flowing through the middle of the ranch is the Crabgrass Creek. There are three very well blazed trails found within the ranch. Being that it is a WMA, hunting is allowed frequently. At different times, entering Triple N for hiking and biking while hunting is going on is ok, but I don’t recommend it if there is any large game hunting going on. If the road gate which leads into the area from RT192 is open, stop and check with the local FWC agent before attempting to enter the area. If you elect to use one of the other entrances, make sure you check the hunting calendars before going in. When hunting is going on, hunters have access to the whole area, so you never know where they might be. There is no charge to use Triple N Ranch. The state provides plenty of parking, picnic tables and a restroom at the entrance on RT192 (during hunting season, picnic tables might be scarce). 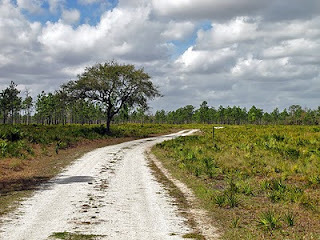 If you elect to bike the area, stay on the many roads which crisscross the whole ranch. You will certainly see more of the area than you ever could hiking around it. The local FTA has created three trails for hikers to use. 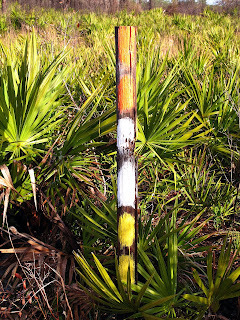 Each of the trails is well blazed with different color paints to show you where to go. In all cases, certain parts of the trails overlap one another, so you can see blazes for all three trails at certain times. Each trail will be described in detail later in this posting. As I mentioned, you will encounter a variety of ecosystems while venturing around the area. 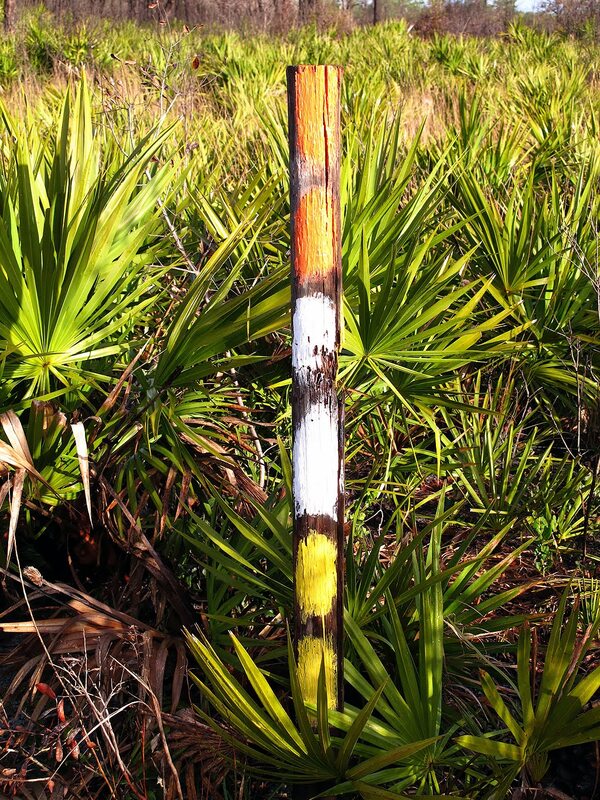 It is mainly made up of Florida scrub; palmettos, grass and pine trees. 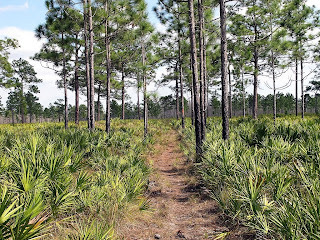 Florida Scrub can be quite pretty, but being that it is mostly located in sunny open areas, you must prepare for that. The area I liked the most was the Crabgrass Creek area which runs through the ranch. This is a classical creek, swamp area guaranteed to meet all your expectations. The creek can be very relaxing and quite beautiful if you appreciate this form of nature. 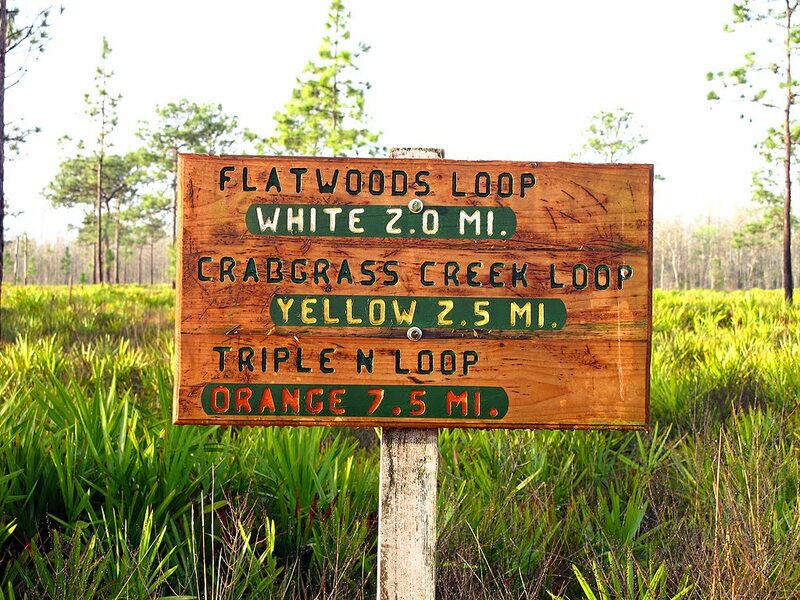 I have hiked all the blazed trails, as well as explored the Crabgrass Creek corridor, other creeks which flow in the area and the surrounding scrub. I always warn visitors to be prepared for the two things nature might throw at you out there, mosquitoes and the sun! I have encountered both of them and it can make a visit a little uncomfortable if you are not prepared – have bug spray and sunscreen available. You should always be able to see some wildlife during a visit; I have seen deer, hogs, turkeys, hawks, vultures and songbirds. The ranch sub-leases the land to local cattleman, so spotting cattle or what they leave behind is a sure thing. If you should encounter a cow, don’t worry, it is more scared of you than you of it – they will disappear before your eyes! One thing that surprised me was the remains of slaughtered hogs killed during a recent hunt, not a pleasant site. If you should come across some hog carcasses, just ignore them and continue on. If you hike the orange blazed trail you will encounter a section in the Crabgrass Creek section dedicated to Cathi Riley. Cathi spent a good deal of time creating that trail; she is no longer with us. 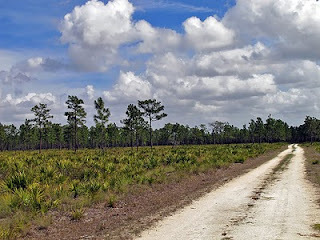 • Flatwoods White Blazed Trail (1.5 miles) – This is a short, true loop, that winds through the pine flatwoods and palmettos; a certain portion of trail is a dirt road. It is a very nice, short hike. A portion of the trail to the East is shared with the orange and yellow trails, so you will not only see white blazes, but also orange and yellow. Just concentrate on the white blazes and you will be fine. 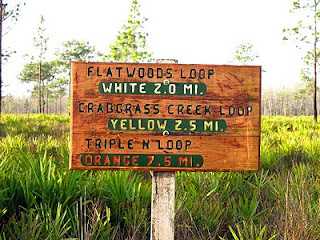 • Crabgrass Creek Loop Yellow Blazed Trail (2.5 miles) – As the name of the trail implies, the only loop section of the trail is down at Crabgrass Creek. 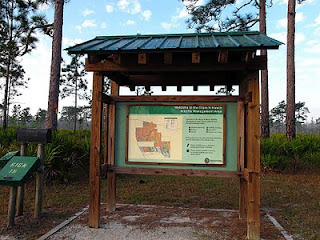 You find the trailhead right outside the parking area; it is shared with the orange and white blazed trail. You will follow it down to where you enter the Crabgrass Creek Corridor (along with the orange trail, so both blazes are present). Stay to the left to enter Crabgrass Creek. You will then follow the yellow blazes through the woods (some might be faded, so if you don’t see the next one, backup and check around). The FTA has provided a wooden bridge to cross the creek. Eventually you will come to a road, bear to the right and then follow the road out of the creek corridor, watching for the yellow trail blazes to right. 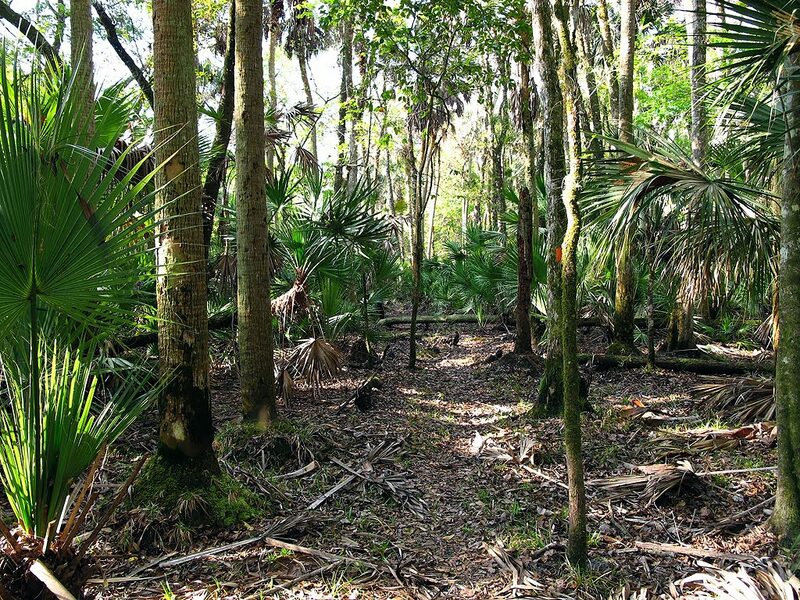 Don’t get confused with the orange trail, which branches off to the left and continues along the creek. The trail will now intersect at the spot you entered the creek corridor (this is the end of the loop portion of the trail), just follow the yellow blazes back to the parking area. Depending on the season, the creek area may be wet and buggy. 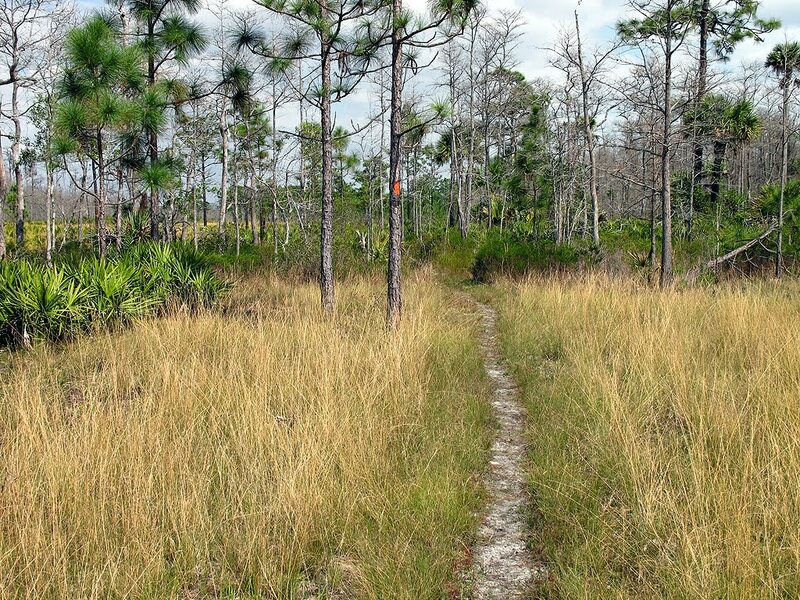 • Triple N Loop Orange Blazed Trail (7.5 miles) – This loop takes you out and around the Triple N Ranch. 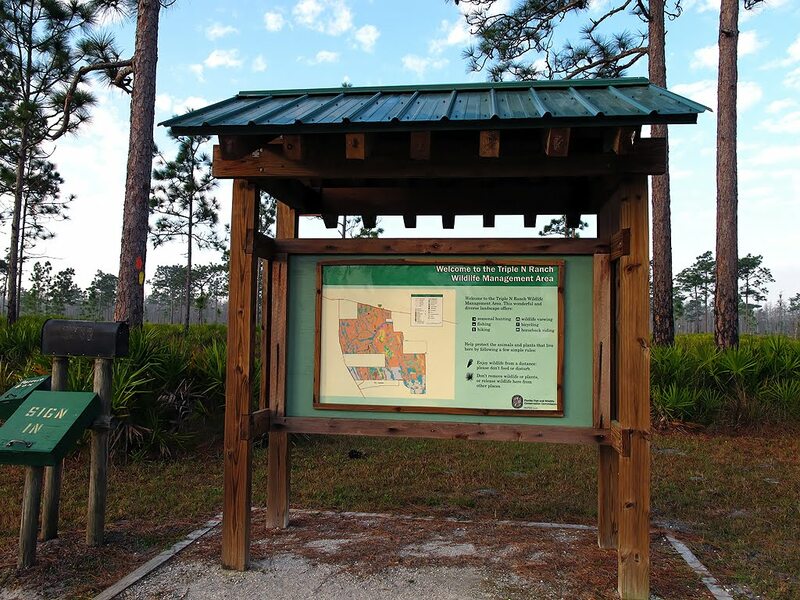 You will pass through pine flatwoods, oak groves, palmettos, grass and a creek corridor. It is a true loop, starting outside the parking area on RT192. You can start the hike from either the East or West sides, I highly recommend you start from the West side because that is the more open section and does get hotter as the sun gets higher in the sky. 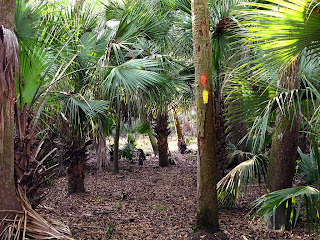 A certain section of the trail (East side) is shared with the other two trails in the area so you will at times see three sets of blazes (orange, yellow and white), just focus on the orange ones. About a third of the trail passes through the Crabgrass Creek corridor, this to me is the prettiest section. 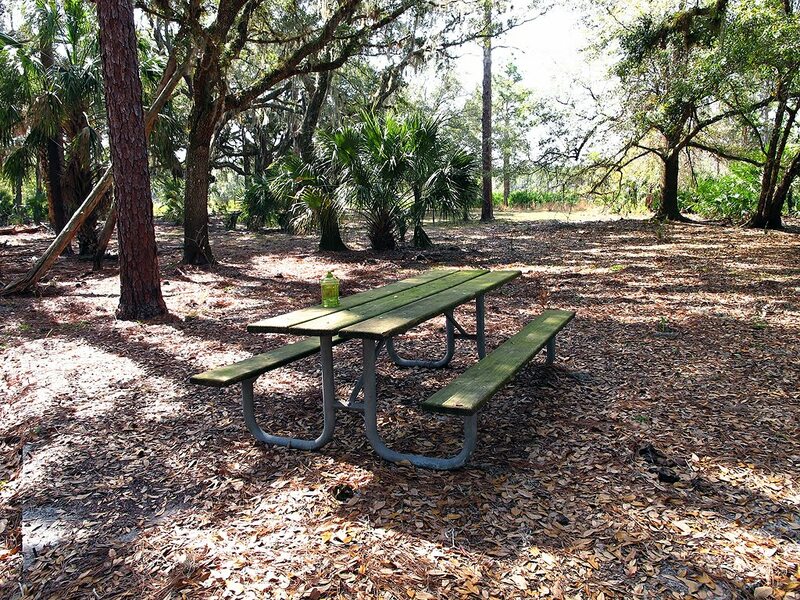 There is a small trail (blazed blue) which leaves the orange trail in the creek corridor section which will take you to a picnic table. Here you can take a break and eat your lunch if you so desire. At times you might not spot the next blaze, just go back to last blaze found and look around. 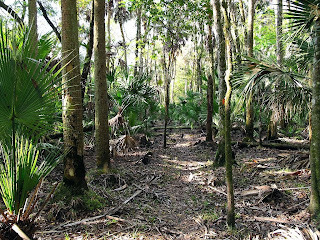 Also note that the Cathi Riley dedicated section of the trail can be found in the creek corridor section of the trail. Depending on the season, the creek area could be wet and buggy. A fair portion of the trail is open, so make sure you wear some sunscreen.